Brazil: (4-2-3-1): Alisson; Fagner, T.Silva, Miranda, Marcelo; Paulinho (Augusto, min. 73), Fernandinho; Willian (Firmino, min. 45), Coutinho, Neymar; Jesus (D.Costa, min. 58). Belgium: (3-4-3): Courtois; Alderweireld, Kompany, Vertonghen; Meunier, Fellaini, Witsel, Chadli (Vermaelen, min. 83); De Bruyne, Lukaku (Tielemans, min. 87), Hazard. SCORE: 0-1, min. 13, Fernandinho (OG). 0-2, min. 31, De Bruyne. 1-2, min. 79, Augusto. It's been a great pleasure to bring you live commentary of this stunning quarterfinal between Belgium and Brazil. I've been Jakub Bobro, and be sure to catch me next time on VAVEL, as well as the shortly upcoming match report. Belgium's Golden Generation comes good! They beat Brazil 2-1 and will move on to the semifinals against France. The key players for them? Thibault Courtois single-handedly kept Belgium alive in injury time, Romelu Lukaku kept driving forward again and again on the counter and was disappointed to go off, Kevin De Bruyne showed why he is considered one of the top midfielders in the world playing in this advanced position, an absolute rocket of a goal. Without a doubt, the no-penalty decision in the situation between Gabriel Jesus and Vincent Kompany will be a talking point in this game, but Belgium will not care one bit. 90+5: Belgium win a corner, just trying to see this game out! 90+4: A huge chance for Brazil again! Costa cuts in, passes it to Neymar who bends it in but Courtois comes up with what seems like the save of the tournament. 90+1: Fagner crosses the ball in to the far post to Neymar, he shout for a penalty because he got some contact on the back, but no call. 89: So much pressure from Brazil. Marcelo's cross is cleared. Hazard starts a counter, and Fagner gets booked for taking him down. 88: Neymar drives into the box, but his touch is too heavy and goes out of bounds. 86: Substitution: Romelu Lukaku is surprised to see he is coming off for Youri Tielemans, another defensive substitution. 84: A huge chance for Brazil! Neymar lays it up for Coutinho on the run and it is a terrible mishit. 83: Substitution: Nacer Chadli comes off for centre half Thomas Vermaelen, defensive change. 76: Brazil is back in the match! Supersub Renato Augusto find space between centre-backs and a great header past Courtois. This stadium is incredibly loud! GOOOOOAAAAAAL!!!!!! RENATO AUGUSTO HEADS IT PAST COURTOIS!! 75: Brazil came in on the counter. Costa drove inside, had his shot saved by Courtois, Neymar's rebound blocked by Vertonghen. 73: Substitution: Brazil make their last sub before Belgium make their first. Renato Augusto comes on for Paulinho. A like-for-like with fresh legs, a bigger target on corners. 72: Costa takes a shot from afar, but doesn't get enough on it to trouble Courtois. Hazard stays down for a while after getting tackled by Fagner. 71: Thomas Meunier takes down Neymar, gets booked, and will miss the semifinal in case that Belgium advance. 69: Lukaku gets into a race with Miranda on the counter, outruns him for the first two touches, but his third touch goes past the goal line. 63: Costa gets a shot on Courtois and Paulinho can't react fast enough on the rebound to tap it in. 62: A huge chance on the counter from Belgium! De Bruyne plays Hazard into the area, but he can't find the target with a strong shot. 60: Just more and more pressure from Brazil. Costa cuts inside, finds Marcelo with a beautiful pass, but his half-shot, half-cross, gets deflected. 58: Substitution: Gabriel Jesus is off for Douglas Costa, fresh legs for Brazil, more of a natural winger than Jesus. 57: Referee doesn't even go take a look, a huge mistake from him in my opinion. 56: Jesus nutmegs Vertonghen in the box, gets mowed down by Kompany. No penalty call from the ref, but it's reviewed by VAR and it should be a penalty. 55: Paulinho drove the ball into the box despite two defenders on him, he gets a shot away, but Courtois closed down the angles well. 54: On the replay, it's a clear dive by Neymar, tries to get contact from Fellaini, should have been a yellow. 52: It's just chance after chance for Brazil, Firmino wasn't able to get a touch on a cross, another Marcelo's cross was blocked, and Neymar's penalty shout was denied. 49: A beautiful side-to-side in the second half and great defending on both, first Neymar is tackled by Kompany on the edge of the area, prompting a counterattack, where Lukaku wasn't stopped until he was well inside the box by Miranda. 48: Toby Alderweireld is the first player to pick up a booking in this match, a tactical foul on Paulinho. Halftime Substitution: Roberto Firmino on for Willian, let's see how this affects Brazil's shape. Willian did go down for a while in the first half, so maybe a knock played into the decision. A stunning first half of great football! Brazil have been building pressure, Belgium playing on the counter, and it is Belgium that are 2-0 up at halftime. Can Brazil pull a Belgium and find an incredible comeback in the second half? 44: Brazil build and build pressure, work the ball into the box for Neymar, but he can't hold on to it and it's cleared. 42: Kompany tries a backheel flick after a corner and he makes Alisson save it. 40: De Bruyne gets fouled just outside the area by Paulinho, and it will be him who takes it. He went direct, but Alisson punches it over the bar. 37: Marcelo's cross gets deflected and Courtois has the save it from trickling past him. Brazil take the corner short, Coutinho bends it from 20 yards, but Courtois finds another incredible save. 36: Marcelo crosses the ball in to Jesus, but the City striker can't get it on target. 31: The ball is cleared to Lukaku after the corner, he passes three opponents, gets the ball to De Bruyne who fires it past Alisson into the far post. De Bruyne has been incredible in his more advanced role. GOOOAAAAL!!! A BEAUTY FROM KEVIN DE BRUYNE!! 30: The ball bounces to Fernandinho after a corner-like free kick, takes a shot but it's blocked. Neymar has his shot deflected for a corner. 28: Neymar receives treatment on the sideline, getting his ankle sprayed. Meanwhile, Willian goes down after an aerial battle with Vertonghen. 26: Brazil have been putting the pressure on Belgium the past few minutes, results in a long shot from Marcelo punched out by Courtois. 21: A nice move from Belgium started by Hazard. The winger gets out of trouble with a beautiful piece of skill, Meunier puts in a low cross to Lukaku but it's blocked. 19: Coutinho find some space from 20 yards out, goes for a shot, but it's easily held by Courtois. 18: Belgium with a nice counterattack after some pressure from Brazil. Fellaini wins the ball in the midfield, gets it to De Bruyne, who passes it to Lukaku. The striker plays it out wide to Chadli, who gets a cross in but it's headed away. 15: I can't type fast enough! Neymar works the ball into the box, passes it to Jesus who takes a touch about five yards from the goal, but Vertonghen clears it before a shot can come. 14: Brazil trail for the first time this tournament. The last two times that happened in previous World Cups, they crumbled and were eliminated. Chadli plays in a corner, Paulinho and Fernandinho tried to clear the ball, but it deflects from the latter past Alisson. GOOOAAAL!!!! FERNANDINHO SHOULDERS THE BALL INTO HIS OWN NET!! 13: Fellaini gets an obscene amount of space outside of the box, can't quite settle the ball with the first touch and it is deflected for a corner. 11: What a start this has been! Paulinho gets back-to-back chances, getting the ball in the box and winning a corner, and then mishitting a volley after the corner. 8: Thiago Silva with a huge chance for Brazil. Miranda flicked the corner onto Silva with a header, but Silva puts it only on the post with his body. Courtois starts a counterattack, but nothing comes of it as hazard only hits a defender. 6: Fellaini fouls Neymar with a forearm into the neck around the half circle, so Brazil get forward now and win a corner. 5: Belgium are playing the ball out from the back and have enjoyed more possession to start the match. 2: De Bruyne outmuscles his club teammate Fernandinho and gets the first shot of the match, dragging it wide. 1: It seems like Belgium are playing a 4-3-3, with Vertonghen on the left and Meunier on the right. Gabriel Jesus kicks off the match! The match will kick off shortly! Belgium XI (3-4-3): Courtois; Alderweireld, Kompany, Vertonghen; Meunier, Fellaini, Witsel, Chadli; De Bruyne, Lukaku, Hazard. Brazil XI (4-2-3-1): Alisson; Fagner, T.Silva, Miranda, Marcelo; Paulinho, Fernandinho; Willian, Coutinho, Neymar; Jesus. Predicted Belgium XI (3-4-2-1): Courtois; Alderweireld, Kompany, Vertonghen; Meunier, Witsel, De Bruyne, Chadli; Mertens, Hazard; Lukaku. Predicted Brazil XI (4-3-3): Alisson; Fagner, Thiago Silva, Miranda, Filipe Luis; Paulinho, Fernandinho, Coutinho; Willian, Firmino, Neymar. In Belgium, people are clearly realizing that this will be the last World Cup with their Golden Generation in their prime, with Eden Hazard, Thibault Courtois, and Kevin De Bruyne over 30 in 2022. De Bruyne has also been a discussion topic, as his current deep-lying role doesn't seem to get the best out of him, so we might see a tactics change from Martinez. I personally would consider switching to a 3-4-1-2, where Dries Mertens would go out for Moussa Dembele, so De Bruyne would play in front of the midfield and behind a strike duo of Lukaku and Hazard. The headlines on both sides have been dominated by various questions about the starting 11s. For Brazil, the main question is whether Roberto Firmino should finally start ahead of Gabriel Jesus. The Liverpool forward has been impressive off the bench, giving the manager Tite something to think about. This will be Kazan Arena's last game of this World Cup. This stadium finished in 2013 has hosted five games prior, selling out two (France vs Argentina, Poland vs Colombia) to its full capacity at 42, 873. Kazan Arena will continue to serve as the home stadium to the two-time Russian Premier League champion, Rubin Kazan. Belgium's group stage performances have been almost impossible to assess. Roberto Martinez's side got good wins over Panama and Tunisia, but the actual quality of those teams is rather questionable. Against England, Belgium won 1-0, but made nine changes to their starting line-up. Their first actual test came against Japan, but the Asian side was also not among the most highly-rated in the tournament and only snuck out of their group on fair play points. Despite that Japan had an incredible match and were quite unlucky not to push it through into extra time. The first half was rather uneventful, but Japan came out firing in the second half, getting a 2-0 lead in the first seven minutes after halftime. Many were doubtful when Martinez brought on Nacer Chadli and Marouane Fellaini to change the game, but that is exactly what they did. The two substitutes scored two of three Belgian goals, with Chadli scoring the 94th minute winner. Even though this result will raise the morale of the squad, it is quite worrying that Belgium's star studded back three and Thibault Courtois allowed in two goals from Japan. Tite's Brazil haven't been the most impressive team, but they are terribly consistent. Since opening with a 1-1 draw against Switzerland, Brazil have beaten Serbia, Costa Rica, and Mexico 2-0, each win never in doubt. The performances have gotten more impressive, as Serbia didn't have many chances outside of a 10 minute window in the second half and against Mexico, Neymar seemed more comfortable and trusting in his teammates and willing to spread the load around. These are among the reasons why Brazil are the odds-on favorites in the tournament, 11/4 to win. Brazil and Belgium have faced each other four times before, three times in friendlies throughout the 1960s and 80s and once in the 2002 World Cup. Belgium won the first meeting 5-1, Brazil have won all since then. The South American side beat Belgium 2-0 under Luis Felipe Scolari in 2002, a team filled with stars such as Ronaldo, Ronaldinho, Roberto Carlos or the captain Cafu. Rivaldo and Ronaldo scored the goals to eliminate Belgium in the Round of 16. Hello and welcome to VAVEL UK's live minute-by-minute match coverage and commentary. 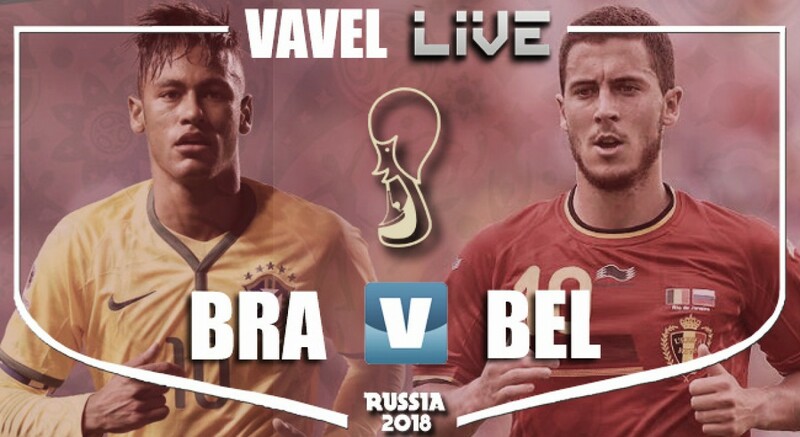 Today, Friday, 6th July 2018, sees Brazil face off with Belgium in the 2018 World Cup. This evening's game kicks off at 19:00 BST, the first knockout game of the tournament. Until then - we'll have plenty of pre-match build-up and analysis from me, Jakub Bobro. Make sure you stay following.